Very few religious texts ever leave the place of worship. If you consult the Kol Nidre any night other than on Yom Kippur, it sings a little less powerfully. It seems inappropriate and off-putting to read over the Passion at any time beyond Easter. The line between holy writ and popular lit is drawn in stone, pitting our reading inclinations tablet against text, and so your choice becomes one of either total secularity or total Orthodoxy. So the stories that compel us are limited to their moment of application — Yom Kippur transforms into a fast and break-fast, and Easter turns into a celebration of bunnies and chocolate. Only one form of religious storytelling is ever permitted to bleed into the secular space — the Haggadah, the story of the Jewish exodus from Egypt, and the book of prayer to accompany the Passover Seder. This story gains new complexity and unanticipated fluidity in The New American Haggadah, edited by Jonathan Safran Foer and translated by Nathan Englander. Foer and Englander’s edition is less a makeover than a workout — by opening up the Passover story, giving stiff words new flexibility, and prodding the text’s eternal questions, they have given readers, both devout and secular, a newly rich and provocative text, one that can be enjoyed long after the afikomen is found. The book is classically laid out, with Hebrew text on the right-hand page (gorgeously illustrated in texturally rich watercolor by the Israeli typographer Oded Ezer) and Englander’s translation on the left. At the top runs a timeline from Mia Sara Bruch, a scholar of Jewish history at Stanford University, charting the history of the Jews from 1200 BCE to present day, from the moment of the actual diaspora’s commencement to the reading of the Haggadah today, creating a throughline of historical relevance for the reader. Some readers may feel the text is wanting for a transliteration, but its book is an engaging read despite its absence. I found myself turning the pages in all directions, searching my years of Hebrew school for a language I’ve forgotten, and lost myself in the experience of the text. The New American Haggadah’s strengths are especially prominent in the commentary dispersed throughout the text. 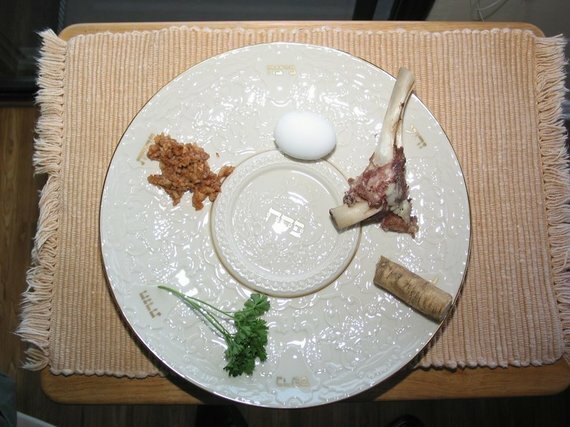 Each major portion of the Seder is accompanied by four perspectives — Middle-East historian Jeffrey Goldberg (“Nation”), director of the Center of Jewish Studies, Nathaniel Deutsch (“House of Study”), novelist and scholar Rebecca Newberger Goldstein (“Library”), and novelist Lemony Snicket (“Playground”). These contrasting voices bring out the multitudes of questions and quandaries inherent in the Passover story, and by secularizing the commentary, giving it over to political, liturgical, literary, and elementary analysis, they have made this into a vitally relevant piece of philosophical inquiry. Goldberg’s “Nation” contributions are especially vital, contextualizing the Seder as a moral code that we as global citizens have tried (and failed) to uphold. (Sharp eyes will immediately scan the text for his take on the Israel-Palestine quagmire.) And Snicket’s witty asides bring the perfect amount of snark to the text — it will keep the antsy adolescent attendee entertained throughout the Seder while keeping them engaged with the evening’s message. (Especially great is the retort to that ever-condescending narration of the Four Children — Snicket offers, as an antidote, “The Four Parents.”) Ending the Seder with Snicket’s Seinfeldian examination of the bizarre Aramaic song, “Chad Gadya,” lets you leave the table with a belly laugh — made even more enjoyable after the required four glasses of wine. Within each newly framed line, however, is a question — not one of the four questions, not even the major one, “Why is this night different than all other nights?” The question is the ambivalence of our worship: how, in a universe where chosen people were forgotten and made to toil under the yoke of slavery, and where their exodus came only at the price of further slaughter and plagues of suffering, do we believe and enact justice as spiritual citizens? The question of how to be good in a world that has not been good to us, colors Ezer’s powerfully violent illustrations for the 10 plagues. And yet these unanswerable questions do not defeat us as readers, but emboldens us. Ambivalence is empowering, for it demands that we debate and engage with our faith. In Englander’s translation on the Shema, the holiest of prayers; he says, “Blessed is the One that is Space and the Source of Space, the One that is the World but whom the World cannot contain…” In the complexity of our devotion are the unanswerable details of how we maintain faith. The most provocative sequence, in which a single illustrated word vibrates in pale green and which Englander translates to “With how many layers of goodness has God blessed us?,” made me run to several different books in attempting to find the exact Hebrew transliteration, all to no avail. Yet in the searching for the transliteration, I felt more connected to the Passover story than ever before. As Foer notes in his introduction, “Here we are, as night descends in succession over all of the Jews in the world, with a book in front of us.” No other holiday is so centered on storytelling, so focused on the power of narrative and the responsibility that narrative bears. And so this night becomes a living narrative, and so each time we gather around the Seder table to tell it, we imbue it with new possibility. “Here we are,” Foer says, “individuals remembering a shared past and in pursuit of a shared destiny. The Seder is a protest against despair.” Though we may wish to parcel out our moments of religious contemplation, leaving the big questions for the synagogue, The New American Haggadah makes worship a radical act of intellectual inquiry. Goldstein says, “It is the intimate spaces that the unwelcome and necessary revelations come, and we withdraw from those intimate spaces at our peril.” By bringing old stories and new questions together at the Seder table, we ask the unwelcome questions, and the revelations come in multitudes. Jessica Freeman-Slade has written reviews and commentary for Full Stop, The Rumpus, The Los Angeles Review of Books, The Kenyon Review, and Specter Magazine, among others. She lives in Morningside Heights. Sipping Champagne at my kitchen table on a hot August night, I flipped through the fat book, Women In Clothes. There was my little blurb, which made me cringe only a little to see in print, in which I talk about how, after my boyfriend telling me I needed to dress better, I went out the next day and spent $250 on clothes. My confession was right there alongside other similar personal confessions from over six hundred women around the world. Women In Clothes is a crowd-sourced, multi-form anthology consisting mostly of survey responses from regular, everyday women (like me) as well as from famous intellectual-artsy women (including Lena Dunham, if you needed me to even tell you that; you’ll find Eileen Myles and Roxanne Gay in there, as well). The survey answers, which are cleverly organized, are supplemented by essays from and transcribed conversations between similar such intellectual-artsy women, and wonderfully minimalistic and eclectic photo essays made up of personal collections, ranging from nail polish to handmade guitar straps to ear plugs. Women In Clothes is the result of a collaboration between authors Sheila Heti and Heidi Julavits, and visual artist Leanne Shapton. It is a striking endeavor in that it is, as mentioned before, verifiably “crowd-sourced” and contains no input from anyone who could be considered a style icon, although a former fashion model and a prominent fashion critic are amongst those who contributed survey responses. The book is, in this sense, a truly contemporary item, representing an age brought along through the Internet’s dominance, in which all opinions are valid, and sharing private thoughts and practices is acceptable. And H&M, oh my god, I can’t even be in an H&M, I feel like I’m having a heart attack in there. It smells like . . . To me it smells like diesel or something—gas fumes and textile chemicals. Urban Outfitters—I have the same thing. Every time I walk in there I’m just like, oh my god, it smells like plastic and chemicals and bad news and bad politics and I just (laughs) I don’t want to be there. I paused, looking down at my outfit, which consisted of two summer staples: an Aztec-print tube top from Urban Outfitters, and a striped skirt from H&M. In cities like New York, a capital of both the fashion and art worlds, there is no limit to how well-dressed a woman can be—and not just fashionably so, but also and perhaps of greater import, uniquely and singularly so. It’s a competition to be at the height of stylishness, and yet appear to have risen there almost effortlessly. Despite this competitive veneer, however, when prompted for fashion advice, women may extend solidarity. Occasionally, minding one’s own business on the subway, a tap on the shoulder will interrupt. The information will be received with a grateful smile—unless the store named is someplace expensive, like Anthropologie, in which case there might be a slight roll of the eyes. Last fall, I saw a co-worker who I didn’t know very well on a lunch break, reading Sheila Heti’s How Should a Person Be? I ran over and hugged her, so glad that she was sharing this magical literary treat. Had she been wearing the same dress as me, the reaction would have been much different: a snide glance instead of a hug. A pivotal scene in How Should a Person Be? occurs following a trip to Art Basel Miami during which the narrator, Sheila, purchases the same yellow dress that her best friend Margaux has just decided to buy. Back in Toronto, Sheila receives an e-mail from Margaux confessing that she is upset about the incident. She has even decided to give the dress away. Sheila and Margaux are not just any women; they are intellectual-artsy type women. They consider themselves serious—and often mention how glad they are to have found each other, “a girl who was as serious as me.” In a September, 2013 article in the New Yorker about Eileen Fisher, Janet Malcolm leads with this confession: “There is a wish shared by women who consider themselves serious that the clothes they wear look as if they were heedlessly flung on rather than anxiously selected.” And yet the message of Women in Clothes is clear: daily fashion choices are incredibly important for most women, often involve an incredible amount of anxiety as well as a good deal of creativity and resourcefulness, and ultimately consume a good deal of our time, energy, and emotions—regardless of whether we exist in a style-conscious setting or not. Reading Women in Clothes, I became interested in how it was a collaborative endeavor. How had a subject that I felt created anxiety and divisiveness amongst women—as it does in Heti’s novel—been channeled into a creative endeavor? How had it become something shared not only between the three editors—as well as various collaborators who worked closely with them in analyzing the surveys (Mary Mann) and designing the book (Kate Ryan)—but also by hundreds of everyday women, like me, who had become involved in its making? I reached out, via e-mail, to the book’s editors. The project’s birth was rooted in its absence, when Heti sought and could not find a book that would explain “what women thought about when they shopped, when they put outfits together,” she wrote me. “All the books I found approached dressing from the outside, not the inside. They were so image-based, or else about a specific stylish woman, like Audrey Hepburn.” Upon this realization that the book she wanted to read did not exist, Heti began e-mailing her friends, asking them “What is your process when getting dressed in the morning?”Heidi Julavits replied with some thoughts, suggesting the subject could become a book; the next thought was to include Leanne Shapton. The three began communicating over e-mail, over time incorporating other online collaboration programs into their process: Google Hangouts, Skype, Dropbox, and Google Docs. Only a week before my e-mails with the editors, I had sat in a coffee shop, my attention distracted from their book by a woman sitting near me, conversing with a friend. Everything about this woman was perfect—her oversized necklace, her silky white tank top, her casual, baggy black pants, her minimalistic make-up. She saw me eyeing her, again and again. But I said nothing. Who knows how she took my glances—perhaps as praise, but also perhaps as criticism. And these glances happen so regularly on the subway, in shops, on the street. They are, it seems, part of the secret language of being a woman—the way we constantly judge ourselves and others based on superficies and artifice. Can a book like this counteract these tendencies, likely instilled in many of us through too much time in our teenage years reading fashion magazines, which told us how to dress and what to look like? Can it, furthermore, make us think twice before we purchase clothes that implicate us in a web of human rights violations via factories around the world, and move us toward slightly more sustainable enterprises (I won’t even get into the whole American Apparel situation here, but let it suffice to say that many humanitarian companies do exist). A book like this can probably do that work, to some extent. But what it really makes me want to do is create art in a collaborative fashion—to find ways to work with other women rather than against them. I am jealous of the editors of Women in Clothes not because they have cool clothes or great hair, or perfect bodies. I am jealous, and admire, that they found a way to work together to create something a little bit revolutionary, and then shared the experience with so many people, giving us the opportunity to contribute in ways small and large. Both books are about how falling in love for the first time, particularly if you’ve never seen a love story you can relate to, can be as terrifying and confusing as it is joyful. As the war in Iraq commenced what seems like ages ago with the frenetic coverage of embedded reporters and the televised firefights, I remember looking forward to reading some of the books that would inevitably come out of this media frenzy. In the nearly two years since there have been many of these books, some good and some bad. I recently read a couple of them. Actually I listened to Naked in Baghdad by NPR correspondent Anne Garrels on the long drive from Chicago to New York. The audiobook is read by Garrels and her husband Vint Lawrence. Garrels’ strong, familiar voice added a lot to the experience. Though Garrels was one of just a handful of American journalists to stay in Baghdad during the run-up to war, the political and military machinations going on around her are just one element of the book. The meat of the book is devoted to her personal relationships with her fellow journalists, minders, drivers, and the myraid Iraqi officials who spent the regime’s final days collecting bribe money. As an inside look into the harrowing life of a war correspondant, the book is brilliant, filled with menacing bad guys and explosions that are way too close for comfort. But Garrels is at her absolute best as she delves into the backroom politics of the world of the macho foreign correspondant. She revels in the fact that American television left Baghdad before the war, leaving only an old school contingent of print reporters to cover the invasion from the capital. She pulls no puches as she berates CNN’s arrogance and Geraldo Rivera’s foolishness. Her demand is for professionalism over sensationalism.Most journalists were forced by uncertainties in Baghdad to cover the war by embedding with American units as they invaded Iraq. Rick Atkinson was one of these embedded journalists, and his book, In the Company of Soldiers tells the story of his time with the Army’s 101st Airborne Division. Aside from his duties with the Washington Post, Atkinson is also a military historian of some repute (his World War II book An Army at Dawn won a Pulitzer in 2003) and it shows. He is interested most in the tactics employed during the invasion and in the commanders who implemented them. Where Garrels delivers portraits of shady Iraqi bureaucrats and flamboyant European journalists, Atikinson’s narrative is tied to Major General David Petraeus, a no-nonesense military man. The 101st, and Atkinson along with them, saw their share of action during those early days, but much of what transpired during those first weeks feels like a footnote — or ancient history — compared to all that has happened since. The most interesting parts of the book are the most personal. Atkinson’s daily struggles against the harshness of the desert and the austerity of military life shine far more brightly than the methodical movements of the troops he travelled with. Both books take the US to task for fouling up the aftermath of the invasion, but where Garrels’ concerns seem to arise from her daily interactions with Iraqis, Atkinson’s epilogue seems hastily tacked on, an attempt to save the book from being made irrelevant by the nasty turn that this war has taken.RELATED: In October I met Anne Garrels, and I met Rick Atkinson in October 2003. Dogma is the second in a projected trilogy by Lars Iyer. Like its predecessor, Spurious, this book is surreal, brainy, plotless, and arguably pointless. It is also brilliantly written and very funny. The only problem is that, in wondering who else might enjoy it, I couldn’t think of anyone I know to whom I could give an unqualified recommendation. True, that might suggest something about the kind of people I hang around with, but I can’t help noticing that it suggests something about these books too. They’re certainly not for everyone. In fact, I fear that relating to these characters might be a warning — the fading canary in the mental health coalmine. Dogma, like Spurious, is told entirely through the interactions of Lars and W., a pair of philosophy lecturers and writers locked in a strange semblance of friendship. Though they live on opposite sides of England, they have frequent phone calls, visit each other, and even travel together. Sometimes W.’s girlfriend Sal is in tow, but it’s usually just the two of them, operating like a combination between Waiting for Godot and Withnail and I. Early on, the men embark on a lecture tour of the southern United States, and it appears for a flickering moment that the book might contain a beginning, middle, and end. Maybe character arcs too. But that plotline goes cold pretty quickly. Iyer isn’t interested in starting in one place and ending up in another. Instead of developing, his characters circle the drain — a fitting arrangement for a pair who obsess about entropy while seemingly doing their best to embody the concept. They share an incredible inventory of obsessions: the end of the world, the connection between religion and capitalism. They love the mysterious Texan musician Jandek and the slightly less weird Texan musician Josh T. Pearson. W. can’t stop talking about Franz Rosenzweig, and frequently wonders if God’s existence can be proven through higher mathematics read in the original German. They obsess over the relationship between Kafka and Max Brod, the friend who made Kafka posthumously famous, repeatedly asking of themselves and one another which of them might be Kafka to the other’s Brod. W. can’t stop talking about the Hungarian filmmaker Béla Tarr, and, in particular the film Werckmeister Harmonies. This isn’t merely a list of preoccupations. They’re practically fetishes, ground to be covered again and again. Repetition is somehow key to Iyer’s project. When the men decide to start a new intellectual movement of somewhat unclear underpinnings and call it “Dogma,” W. devises the rules and then repeats them, revising and elaborating on them. The effect of so much repetition is that the sequence of the book — which is divided into many small sections of just a few pages each — is all but irrelevant. Dogma reads almost like a collage, a fitting style for a book more concerned with philosophy than narrative. Ideas drive everything. Lars and W.’s biggest fear is that they are cursed with the ability to recognize and appreciate important intellectual contributions, but are unable to make significant contributions of their own. Or — somewhat more poignantly — they fear they’ve actually had their great ideas and forgotten them, or that their great ideas passed in conversation without either of them realizing it. The reader is put in the position of wondering the same thing as he reads. Have I missed the point in all this? Iyer employs the first-person perspective with fantastic flair and originality. The narrator, Lars, reveals himself almost exclusively through the words of his friend and says practically nothing about himself directly. It would be challenging, if not impossible, to find a page in Dogma which does not contain the words “W. says.” This narrative choice is especially interesting given that W.’s primary mode of communication with Lars is scathing criticism, of his weight, his clothes, this apathy, his failure to do good work or to think deeply. In a late scene, W. wishes for Lars to join him at a meeting with his employers, with whom he has developed an adversarial relationship. “Why not take a lawyer, I ask him. He’s allowed to. No, he wants the equivalent of an idiot child, W. says. He wants the equivalent of a diseased ape with scabs round his mouth throwing faeces around the room….Did you see who he had with him?, they’ll say. What he had with him? My God, we shouldn’t make his life any worse: that’s what they’ll say, W. says. And perhaps then they’ll show mercy.” Relentless and very funny, the abuse never seems to bother Lars, who receives it in a state of either bemusement or agreement — it’s never clear which. When, years ago, Roger Ebert reviewed W.’s favorite movie, Werckmeister Harmonies, he described it as “maddening if you are not in sympathy with it, mesmerizing if you are.” It’s a perfect characterization of Dogma’s protagonists. “We’ve become strange, W. says. We’ve spent too much time in each other’s company… We’re no longer fit for human society, W. says.” He’s almost right, I’m afraid. But not quite. I don’t know who else might like this strange book as much as I did, but, as for me, I can’t wait for the third. Created on a website, crowd-sourced in serial, 'Beijing Comrades' is the people’s public fantasy of intimacy. The result is a classic of queer consciousness-raising erotica.